Washington, D.C. is home to more than 175 foreign embassies, so it makes sense that the city's food scene is incredibly diverse too. 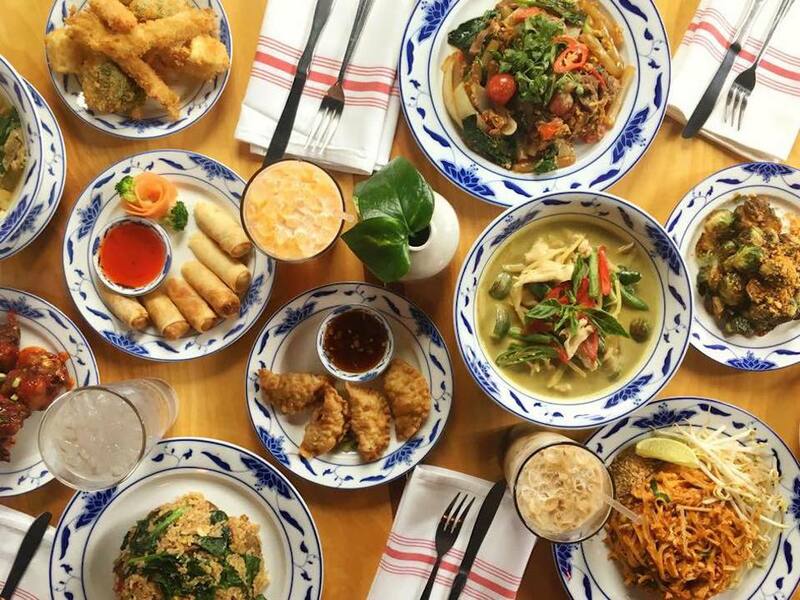 Thai cuisine is well represented in Washington. While restaurants with Thai food abound, here are eight stellar options for flavors that hail straight from Bangkok. The list spans classics like curries, drunken noodles, and pad Thai along with meals that bring the spice — and a restaurant that specializes in trendy foods like bubble waffles. This colorful restaurant near Dupont Circle is designed to make you feel like you're on the streets of Bangkok. You're going to want to save room for dessert, because bubble waffles are on the menu here. Opt for Thai tea or chocolate chip bubble waffles served with ice cream in flavors like lychee or sesame, and covered with all the strawberry Pocky and chocolate cornflakes you could ever want. For savory dishes, don't miss snacks like Thai style homemade chicken nuggets and deep-fried, marinated beef strips served Thai jerky style with sriracha sauce. There might be a line for this highly-acclaimed, no-reservations restaurant near Dupont Circle specializing in northern and northeastern Thai dishes. Those willing to wait for the walk-in only Little Serow will be rewarded with a set menu served family style with bold dishes like fish dumplings served with burnt coconut and lime leaf, along with tender Si Krong Muu pork ribs. Get ready for some spice, and diners should know that the meal usually includes pork, seafood and nuts with no substitutions. Since the menu changes weekly, each visit to Little Serow offers a unique dining experience. Washingtonians can't get enough of the stylish neighborhood restaurant Beau Thai: there are outposts in both Shaw and Mount Pleasant, with similar sleek decor and oversize photographs on the wall. The menu here is just as bright. Popular dishes include a salad with green papaya, grilled shrimp, tomatoes, string beans, Thai chilies, and crushed peanuts with a lime dressing — along with favorites like drunken noodles. At the Mount Pleasant location, warm up with homey noodle bowls topped with roast pork, duck, chicken, beef, or vegetables. For a unique meal out, make reservations well ahead of time at Thai X-ing in Shaw. You'll feel as though you're dining in chef/owner Taw Vigsittaboot's home with this pre-fixe menu that's constantly changing — although there are mainstays like the pumpkin curry and mango sticky rice for dessert. Some nights are geared toward vegetarians and vegans, so check before you go. The price will vary depending on the day's dishes and the number of diners in your party. The owners of Beau Thai branched out with another restaurant in Shaw: Thai noodle house, BKK Cookshop. This fun spot, with a very pleasant patio, serves street food-inspired appetizers like pumpkin empanadas, Thai sausage, and steamed buns. For main dishes, try Bangkok spicy noodles with ground pork or a pad Thai derived from a family recipe. Office workers in downtown D.C. turn to Soi 38. With its very handsome dining room with gilded artwork, the Bangkok street food-inspired restaurant specializes in dishes like Khao Soi with chicken legs, egg noodles, khao soi curry, and pickled mustard greens or Kana Moo Krob, flash-fried pork belly, Chinese broccoli, garlic, oyster sauce. The extensive menu suits every taste. If you want to go beyond typical Thai dishes, seek out this upstairs restaurant known for its authentic fare — which in this case, means lots of spice. Try the glass noodle soup with chicken and shrimp or homemade fishball green curry with eggplant, Thai thin rice noodles, basil, and chili. The kanom krok or coconut milk pancake snacks are a big favorite here for dessert. Finish a day of sightseeing in D.C.'s historic Georgetown neighborhood with a meal at Bangkok Joe's on the scenic Georgetown waterfront overlooking the Potomac river. With its inviting, red-accented dining room, Bangkok Joe's is known for its lunch deals. The restaurant serves Thai food with a twist, influenced by both American flavors and Japanese, Chinese, Vietnamese, and French dishes. Bangkok Joe's is home to a Dumpling Bar too.